With the rise of numerous award-winning adventure films over the last 12 months – think Tracks and Wild – a leading travel experience provider has reported a 35% increase in walking and hiking tour bookings. 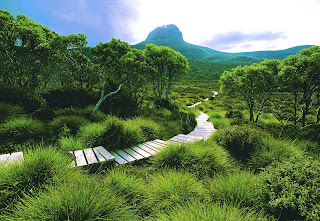 With hundreds of epic hiking trails to choose from, Experience Oz has released a shortlist of Australia's must-experience walking and hiking hotspots for 2015. From coastal scenery dotted with pristine lakes to red deserts scattered with rugged gorges and canyons, it's no surprise that hiking and day walks are increasing in popularity around the country. Experience Oz Digital Marketing Manager Matt Hobbs said hikes and walks are not only for the professionals, but for any outdoor enthusiast who was keen to experience the stunning natural beauty Australia has to offer. "As the saying goes, 'Everywhere is walking distance if you make the time', and Australia is renowned for having some truly incredible walking and hiking tracks, so we encourage all outdoor enthusiasts to discover the hidden treasures that are just waiting to be enjoyed," Mr Hobbs said. "The geographical diversity of Australia ensures there's something for everyone. Enthusiasts can really get out there and conquer the more challenging hikes, while there are great options for beginners too." Mr Hobbs said a growing number of Australians are taking up hiking or walking, and tourists are also keen to check out Australia's stunning world-renowned landscapes, whether it's to feel the sand between their toes on a deserted beach or enjoy uninterrupted views of rugged terrain. "From families experiencing the great outdoors on easy bush walking trails to the more serious adventurer, walking and hiking appears to be an ever-growing trend – evident in the increased number of bookings we have been receiving for our guided tours," he said. "To make it easier for those who share a passion for exploring our great country, we've identified where to go and the best time to visit, so that people can easily make the time to walk and explore this magnificent land from a different perspective." Experience Oz offers a range of walking experiences, including multi-day and single-day tours, guided or non-guided, and some with food, beverage and accommodation options or inclusions. For more information, please visit http://www.experienceoz.com.au/australias-walking-hotspots. Experience Oz + NZ is one of Australia's leading travel experience providers, offering thousands of adventures throughout Australia and New Zealand including day tours, theme park tickets, attraction tickets and activities. Visit www.experienceoz.com.au for more information. Length: Extensive 6-day hiking trek. 65km. Widely considered one of the world's best bushwalks, Tasmania's Overland Track is stunning natural beauty exemplified to the fullest. Walkers can experience pristine mountain streams, radiant waterfalls, vibrant meadows and numerous other phenomena combined to make for a breathtaking spectacle awaiting around each bend. Featuring the option to stay in a series of high-grade huts, the Overland Track is undoubtedly Australia's most memorable adventure to be had on two feet. Length: Scenic 4-day coastal journey. 20km. The Bay of Fires Lodge Walk is perfect for anyone looking for a more leisurely introduction to the world of Australia's Great Walks – easily negotiable with spectacularly colourful terrain. Explore one of Australia's most picturesque destinations with an itinerary that incorporates some of Tasmania's most stunning scenery. Breathtaking white sandy beaches colliding with ruggedly beautiful rock formations, bright orange rocks contrasting brilliantly with blue waters, and a myriad of bird and animal life are just some of the highlights. Perhaps Australia's most popular mountain range for travellers due to its close proximity to Sydney, the Blue Mountains feature massive cascading waterfalls, distinctively rugged peaks and nearly endless opportunities for exploration both on peak and in canyon. Boasting over 140km worth of trails and 12 separate sections to choose from, walkers can handpick whichever route most piques their interests, from rainforests, waterfalls and canyons to heathlands and wildlife. Length: 8-day coastal journey. 104km. Featuring incredible coastal scenery, the iconic Twelve Apostles rock formations, rocky cliff faces and vast stretches of open beach, the vivid red hue of the sun dappling its colours and shadows over the craggy cliff faces and reflecting off the water below creates one of nature's most impressive sunsets. Spread out over the course of just over 100km, this track is suitable for walkers of any ability level and combines some of Australia's tallest coastal cliffs with the remnants of various historical shipwrecks. Length: 5-7-day scenic coastal walk. 135km. The wonderfully untouched coastline of South-West Australia is a tapestry of colours, running alongside the brilliantly blue waters of the Indian Ocean from Cape Naturaliste in the north to Cape Leeuwin in the south. Situated in the Margaret River wine region, this is the longest coastal track in the country and offers incredible coastal scenery from cliffs and limestone caves, to headlands, unique rock formations and lush Karri forest. Length: 4-day hiking itinerary. Approx 42km. What was once an ancient seabed is now a cavalcade of peaks surrounding craggy sandstone bluffs, dry creek beds and deep valleys lined with a variety of native vegetation that makes for one of Australia's best and relatively uncrowded hiking destinations – the Arkaba Trail. Reminiscent of the Northern Territory, the sheer scale and open spaces of the Australian outback are on full display during this walk, as the backdrop of the rocky Elder Range and Wilpena Pound in the distance makes for an impressive view.